Thanks to everyone who supported my work in 2018. There’s already some new pieces of work in my Etsy shop including these ‘hand prints’ that are new for 2019. 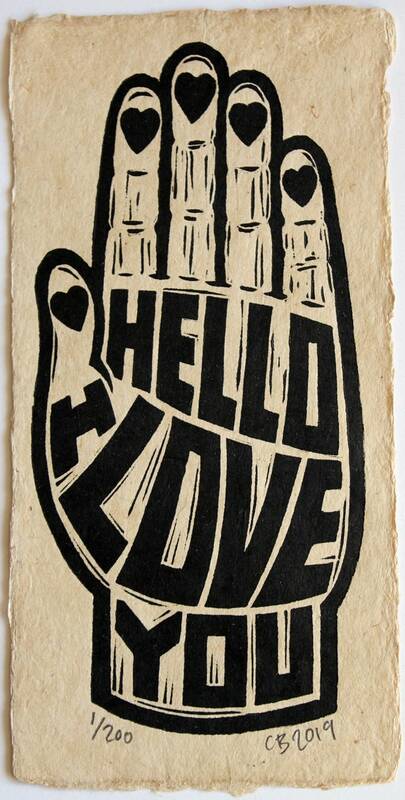 Hello I love you is an edition of 200 on handmade Bhutanese paper. More of hand prints and other new work to follow. 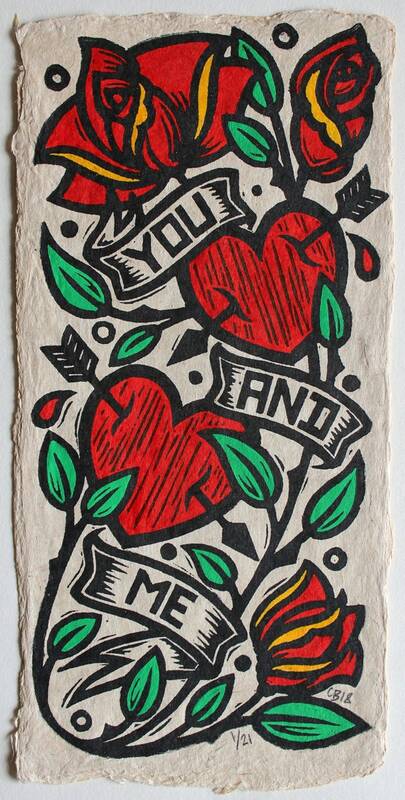 ‘You and Me’ is a new hand coloured linocut print that is now available from my Etsy shop. There’s two hand coloured versions as you can see from the images. They are printed on handmade Bhutanese paper. The full colour version is an edition of just 21, and the other is in an edition of 150. Click the images or visit shop.chrisbourkeart.com for more images and full details. New to my Etsy Shop are these black and white, artist proofs (one off linocut prints that are signed but not yet part of an edition so marked ‘AP’) of ‘Tougher than Death‘. This print is about the eternal nature of the human soul. Each one is unique due to the printing process, creating a heavily textured finish. Click the image above for more detail. Also now available are these one-off coloured versions, printed on hand-spray-painted backgrounds, layering multiple colours for an truly unique effect. The coloured versions are listed and numbered individually, as they are all so different and one-off. It’s hard to see from these images alone, all the fine layering and colour blending. See more on each listings – click images or visit shop.chrisbourkeart.com. All of the Tougher Than Death prints are printed on 80gsm 43x61cm Japanese paper. I’ve just released a new version of my Shine On lino print – Shine On Lilac Edition. It’s printed on handmade Bhutanese paper, that has been partially been sprayed by hand with a lilac acrylic spray paint. I then printed my Shine On linocut over the sprayed paper and finally added hand coloured details to the print with acrylic paint. Follow me on Instagram from more news of upcoming work and process shots – @chrisbourkeart. I’ve just released a new reprint of my 2015 zine/artist’s book ‘If the Wind Won’t Serve Take to The Oars’. It’s a wordless story told in 25 lino cuts, printed in an A5 zine. The new version has a different cover and is fated 2018 on the back. It also comes with four postcards of images from the book – the whale, the lighthouse, shooting star and big wave. The postcards are only available with the book. Click to find out more from my Etsy store here. There are also original lino prints from the book available to buy with the book and postcard set. Full details on these and other items on my Etsy page. My latest lino print is called ‘Burners’ of two hand holding skeletons surrounded by flames. It’s a detailed linocut printed on smooth, white Zerkall 145gsm printmaking paper. I have some signed ‘artist proofs’ available from my Etsy store. For more pictures and full details click HERE. 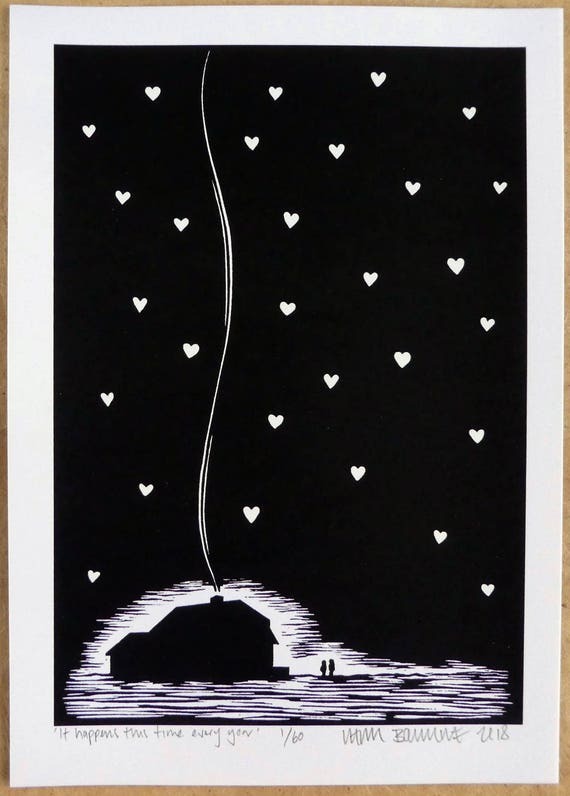 The Lamp is a hand finished linocut print, that has only recently been made available for sale in my Etsy Store, although I made the print in 2017. 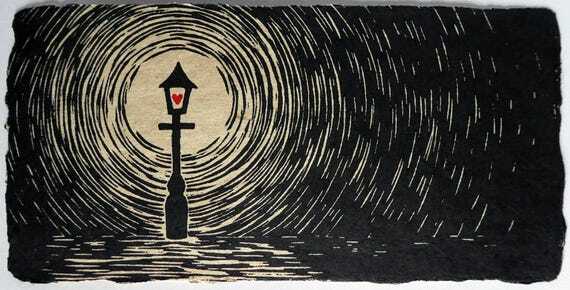 The lino block print was made to print up to and over the edges of the handmade, Bhutanese paper. See more pictures and find out more in my online lino print shop. 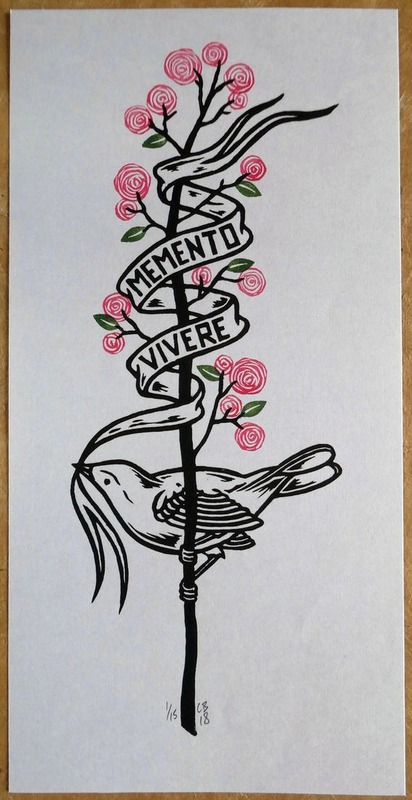 I’ve added a couple of new prints to my Etsy shop in time for Valentine’s day – a new version of my ‘Memento Vivere‘ (Remember to Live) print, hand finished with individually added roses and leaves, only 15 available, and ‘Burning‘ – a small print of two entwined, in love matches, printed on smooth Japanese handmade, printmaking paper, in an edition of 75. Visit www.etsy.com/shop/chrisbourkeart for full details and more images of both prints. 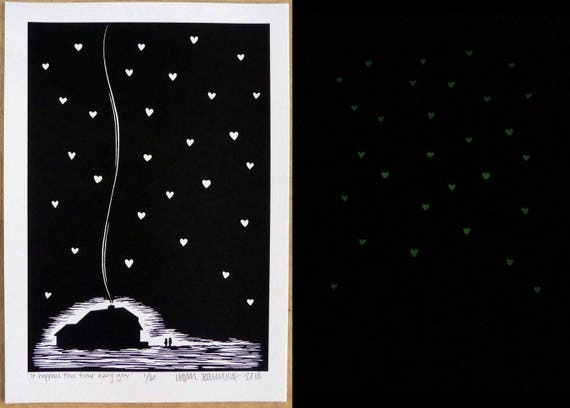 My first new print release of 2018 is a screen print version of my It Happens This Time Every Year lino print, made with glow in the dark ink for the hearts. 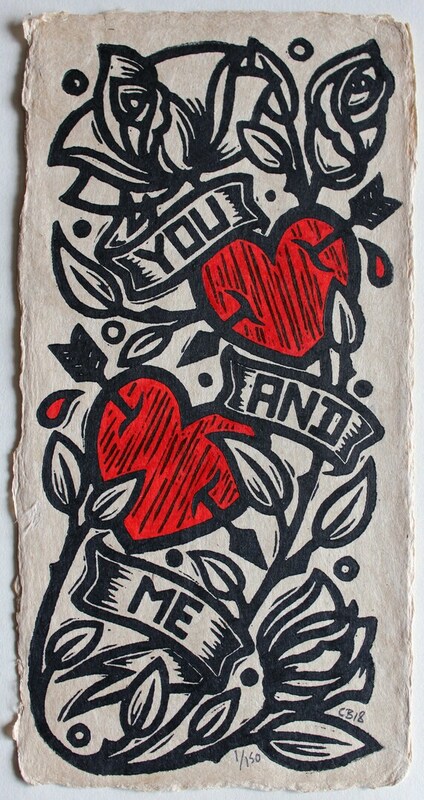 Its now available from my Etsy shop with free worldwide postage & packaging until Valentine’s Day. Click the images to visit the shop for more info, or Click Here.